Another in the series of our blogs – written by one of our volunteers, Rod Cooper – that takes a look at the history of The Children’s Society’s former children’s homes and social work projects since 1881, this one featuring the charity’s work in the North East Region and the creation of new ‘Independent Living’ Projects. During the late 1960s and early 1970s, The Children’s Society was in the midst of a marked transition in the provision of front-line care. The number of residential homes for younger children was diminishing (many being closed, whilst others passed into the control of local authorities), and The Society – which was actively pursuing greater professionalisation of its staff – was in the process of shifting its focus towards the family unit and older, teenage, children (i.e. “young people”). Reflecting society as a whole, this was an era of experimentation and flux for The Society, and these changes had a marked impact on its activities in the North East Region. In the 1970s The Society recognised that young people who were about to leave residential care needed help to bridge the gap between the sheltered surroundings of a children’s home and the self-reliance needed for living on their own. These young people needed a positive setting where they could gain direct experience of housekeeping skills such as budgeting, cooking and shopping. 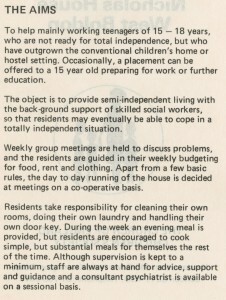 In response, The Society set up a number of community based ‘Independent Living’ schemes during the 1970s and 1980s. These consisted of ordinary flats and houses that could be used by young people leaving care, where they could also get advice and support in preparing for adult life. Several of these were created in the North-East Region. Of particular note was the establishment of The Society’s first venture into the provision of bedsitter accommodation at Nicholas House, West Boldon, near South Shields. Formerly known as St Nicholas’ Home for Boys, this had been a children’s home since 1906. However, by the early 1970s the home had closed and the decision was taken to refurbish the property with self-contained bedsitter facilities for up to seven boys. The project re-opened in late 1974 as Nicholas House, and plans were soon put in place to expand provision and admit girls too. Nicholas House was considered The Society’s first venture in the provision of “half way house” accommodation, and was viewed as a step change from the earlier establishment of hostel accommodation developed in recent years at Nottingham and Kettering. 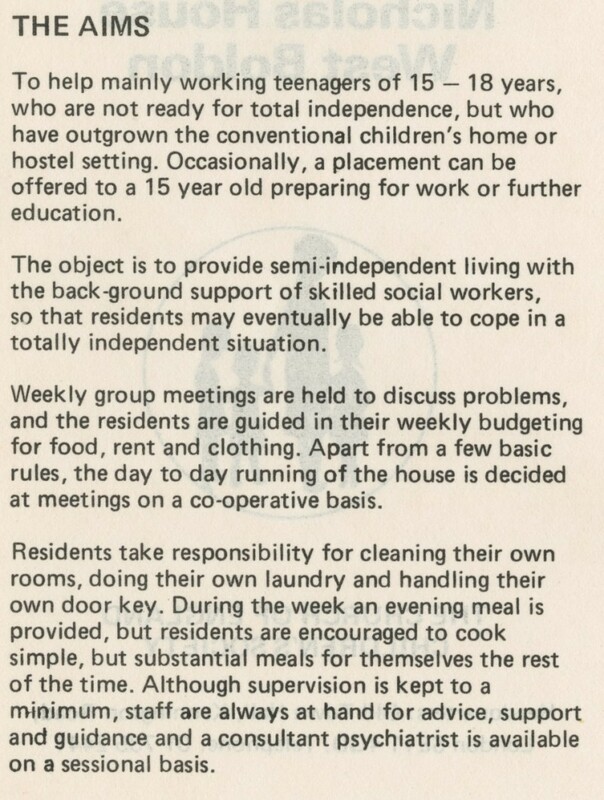 With on-site provision of qualified Children’s Society social workers, the scheme was a deliberate attempt to promote ‘independent living’, and set out to encourage residents (who had all previously being in local authority care) to look after themselves. As such, the residents paid their own rent, provided and cooked their own food, and were free to re-decorate their own rooms. 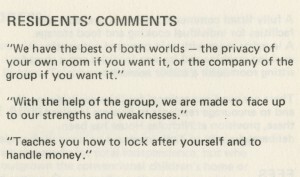 Furthermore, the residents had their own front door key and were free to come and go as they pleased “within limits”. 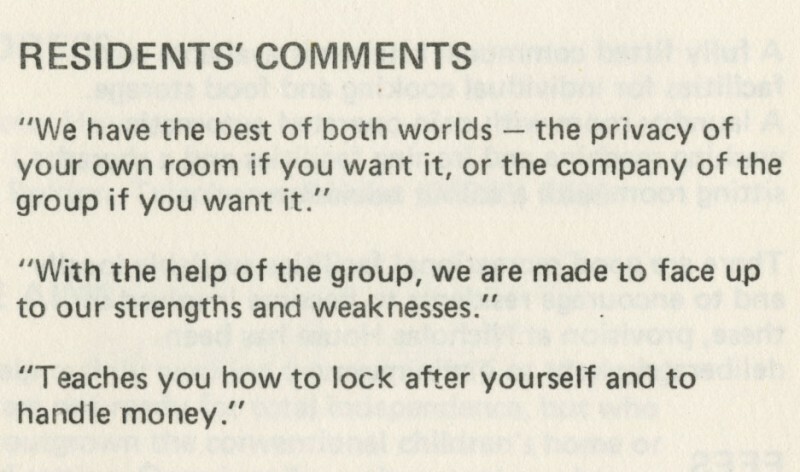 The “object of the experiment [sic] is to bridge the gap between institutional care with complete independence with some built-in safeguards.” (Gateway Magazine, Summer 1976, pp. 4-5). The majority of residents of Nicholas House Teenage Unit – as it was subsequently termed – were formerly in the care of the South Tyneside local authority. However, as residents came to leave the project at age 18, it became apparent to both The Society and local authority that there was a requirement for further after care and a need to ‘de-institutionalise’ residents. Hence, springing directly from the work at West Boldon, there developed a subsequent project in South Tyneside promoting independent living. The project closed in May 1992. 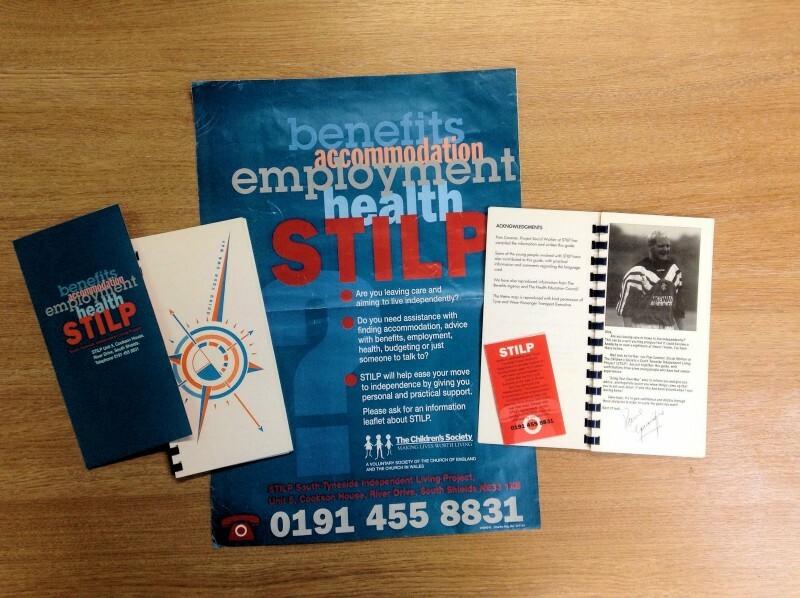 The Project for Independent Living (PIL) or South Tyneside Independent Living Project (STILP) was initially established in 1986, as a satellite project allied to the work undertaken nearby at West Boldon. Having identified the difficulties of residents leaving Nicholas House, and local authority homes in general, The Society and South Tyneside local authority – with the additional support of local housing associations and Barnado’s – provided additional support for up to six young people leaving care in South Tyneside. Described as an ‘assisted lodging scheme’, the project sought to provide continued support for young people leaving care for up to 12 months. It assisted them to find suitable accommodation, and provided practical help with moving and decorating. The project also provided tenants with a drop-in centre for the provision with support and advice. Financial provision for the project was mainly funded by the local authority, with local housing associations providing suitable flats for accommodation. At the outset, The Society’s input relied on the assistance and expertise of staff based at Nicholas House, though in time a dedicated office in South Shields with its own staff (which included a project leader and two social workers) were established for the project as it became independent. Perhaps as a reflection of the prior relationship with activities at Nicholas House and the sharing of staff and facilities, the project’s official opening wasn’t until October 1990. 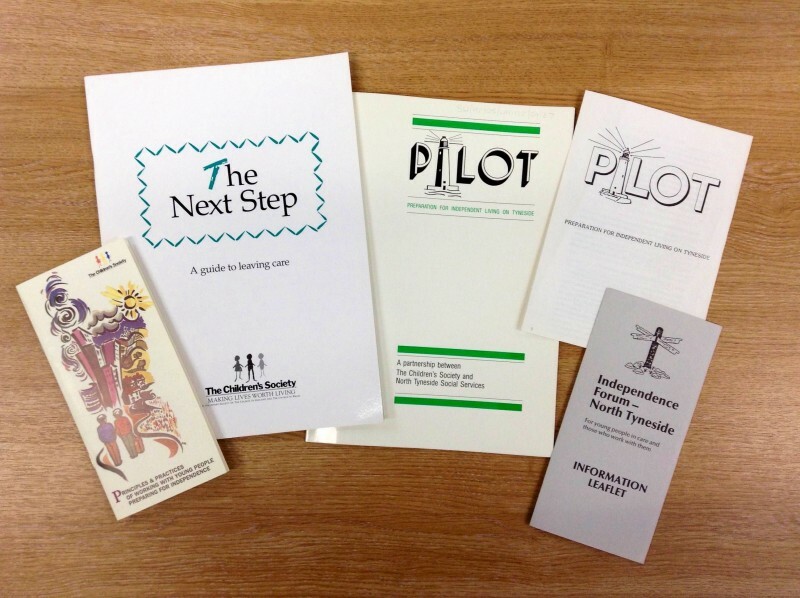 The Children’s Society’s participation in the project continued until April 1998, after which time the project was taken in-house by South Tyneside social services. Mirroring the activities undertaken south of the River Tyne, a similar project was established to the north at Whitley Bay. Initially known as North Tyneside Flatlets, and subsequently termed PILOT (Preparation for Independent Living On Tyneside), the project was initiated during 1983/84 and as the fruition of an approach by North Tyneside social services to The Society to work in partnership to provide a ‘bridge’ for young people leaving residential care. The project commenced on a relatively small-scale, starting with just four young people aged between 16 and 18, living in local housing association flatlets. However, with three full-time staff provided by The Society, the project soon developed to the point of providing accommodation for up to thirteen young people, located either in the PILOT hostel or in nearby flatlets. By the early 1990s as many as six full-time staff were being provided by The Society, and the scheme was over-subscribed. Most referrals to the scheme came directly from North Tyneside (the local authority ‘purchased’ eleven of the thirteen places available) whilst others were sponsored by Durham and South Tyneside local authorities. The Children’s Society continued to part-fund the project until March 1997. Thereafter, activities on Tyneside – in keeping with a general review of strategy – were redirected towards ‘floating support’ and attention towards a broader range of needs allied to The Society’s then operable strategic ‘Justice Objectives’. 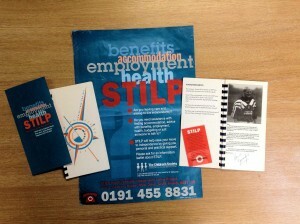 This entry was posted in Archive stories and tagged Independent Living, North East, Social work projects, TYneside by Ian Wakeling. Bookmark the permalink.